Take the Kids to the Comedy Club for Some Good Clean Fun | The Art Of | Kids VT - small people, big ideas! Five o'clock on a Saturday night isn't exactly prime time to see live comedy — unless you're headed to "Good Clean Fun" at the Vermont Comedy Club in Burlington. 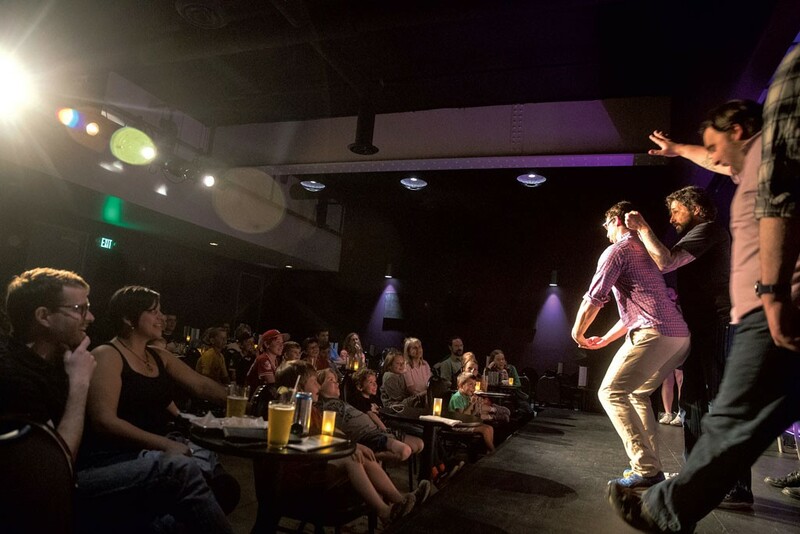 The monthly, family-friendly improvisational show delivers exactly what it promises. On the first Saturday in May, seven members of the club's house improv teams, the Unmentionables and Napoleon, grooved their way onto the stage. They explained that most of their performance would be made up on the spot based on ideas from the audience. One improviser asked for suggestions — things like favorite articles of clothing, pets you could never have and favorite dinners — to start a word-pun game. The audience of around 40 kids and adults enthusiastically shouted out ideas. After agreeing on spaghetti at a family restaurant as the theme, the performers took turns delivering jokes. "Spaghetti walked into a restaurant. The waiter said, 'Are you feeling okay?'" began Mark Stein, an improviser and a teacher at the Schoolhouse Learning Center in South Burlington. "He said, 'Not really, I feel like I got a boil.'" The audience cracked up. Another performer chimed in: "Spaghetti walked into a restaurant and the waiter said: 'Sorry, bowtie only.'" More laughs. The jokes embody what VCC co-owner Natalie Miller means when she references Romantic poet Samuel Taylor Coleridge's phrase, "the willing suspension of disbelief," something on which improv relies heavily. Clearly, spaghetti can't walk, but "kids eat it up," Miller said. "They're less willing to question the make-believe qualities of it." Miller ought to know. She and her husband, VCC co-owner Nathan Hartswick, have nurtured an all-ages comedy scene in Vermont. "We like getting kids onstage," Miller explained. "Kids have such a fun energy, and improv matches that energy." In addition to offering workshops and vacation camps for young people, they sponsor a teen improv team that meets Saturday mornings. One of the keys to doing improv with kids is to keep the comedy physical, Stein said. The next exercise, Action Figures, did just that. Two volunteers, dad Michael Wood-Lewis and 7-year-old Elliot Palm, were directed to move the performers' bodies as if they were action figures. Per audience suggestion, improvisers were cast as servants, and the scene began. Elliot bent an improviser's knees and elbows, covered his mouth with a hand, then extended his arms, trying to accept an imaginary dish from his fellow performer. The contorted positions got laughs from the crowd. Afterward, Elliot said he wasn't afraid of getting up onstage. He likes to act in school and had attended one of Vermont Comedy Club's camps. Jon van Luling, another member of the house improv troupe, put it succinctly: "Kids are fearless." Vermont Comedy Club is located at 101 Main Street in Burlington. The next "Good Clean Fun" performance is on Saturday, June 4, at 5 p.m. For more info and to reserve tickets, visit vermontcomedyclub.com.